On the left you see what it looks like when I sketch out cards by hand. I usually just plan ahead for the kind of info I'll need on the card and watch out for space issues. On the right, you see how that translates to an alpha prototype with stock illustrations and vector icons courtesy of The Noun Project. In its current state, the game is about workers at a communal ranch. They raise dragons for valuable poop. Yup. Each round involves the players performing various ranch duties. A-Shovel: Take X cubes from your dragon and put them into your supply. B-Feed: Deposit X brown cubes onto dragons. C-Shop: Spend blue, red or yellow cubes to draw X, Y, or Z extra cards from the deck. D-Breed: Add a dragon to your ranch. The total Love in your ranch must be equal to or greater than the new dragon. E-Expand: Add a staffer or building to your ranch. Doing so costs you X coin discards. F-Sell: Exchange blue, red or yellow cubes for points. Each suit is ranked 1-8. The ranks 1-5 have a coin background. The lower 3/4 of the card shows a dragon, a building or a staffer for the ranch. Below their picture is a description of some special effects that they have. "When you take this card, take up to two cubes from your dragons and everyone else takes one cube. If this is the last choice, take up to three cubes and everyone else takes nothing." Thus, each player takes a card and performs actions along with the other players. Play proceeds over several rounds, with players gathering resources, placing new dragons and earning points. "When you take cubes from this dragon, they will be either brown, blue, red, or yellow. If there was only one shovel in the auction, these cubes will be brown. If there were two shovels, these cubes will be blue. If three, they'll be red. If four, they'll be yellow." The dragon's love rating of 3 means you need at least 3 Love in the ranch to put it into play. There is also an Adult Green Leaf Dragon in the deck which has a 6 Love rating. That means your ranch must have at least 6 Love to bring out this dragon OR you can play it for free if you have the Baby Leaf Dragon already in play. 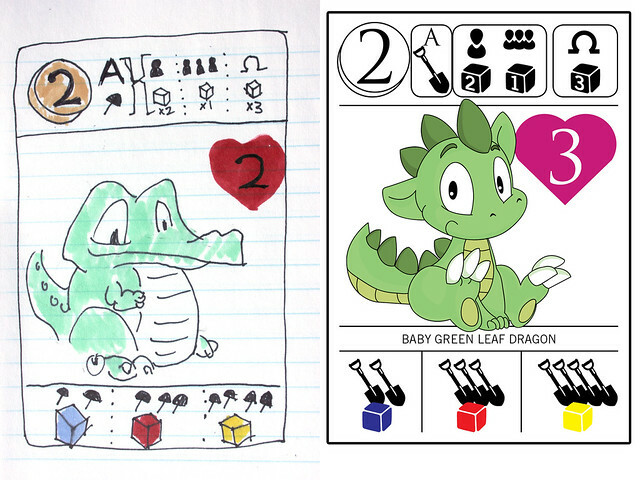 The Adult Green Leaf Dragon has some extra bonuses on top of the Baby's ability. The staffers and buildings each have their own effects, too. Some increase the Love in your ranch, others increase the output of other dragons in your ranch, some make costs lower or allow you to score extra points. The game ends when one player has nine-face up cards in her ranch or when the deck runs out. Score bonus points from cards in your hand. You'll automatically score one point per coin. Also score bonus points for straights and matching suits. The player with the most points at the end wins. So yeah, there's a lot going on in the mechanics, but I'm pleased that it's managed to fit into a very small deck that is information-rich without being overwhelming. At least I hope so! A cuddly approachable dragon should help make the complexity easier to swallow. Very cool! I really like the card layout. It's still terribly opaque. I don't understand the cardflow (deck-hand-play-??) or group ranch/"resources" vs. individual ranch/"resources", or the colorflow in cubes, or why there must be 6 cards in the lineup. Hi ! seems fun, I love the theme, but something comes in my mind : I'd love to play that kind of game with my daughter or nieces, but the icons and the apparent complexity of the system would make that impossible, at least it would frighten them for sure. Aren't you afraid of a problem of coherence between the cute theme and the "heavy" rules ? That's a problem I'm having with Belle of the Ball, too. I have a theme that is very casual, but mechanics that are very tactical. I don't think the two are mutually exclusive, but they are very hard to balance. I've read that. For the little dragons thing it's not really a problem, when you see the average age of people who play farmville or japanese video rpg - but people can buy the game to play with their kids if they see the artwork, and if it's not really accessible... I mean, there's a lot of numbers, variables and icons on a single card - and I guess you have more that one to compare. Before 10/12 years old, kids won't follow. You know what? I think I could simplify the cards AND make the game more interesting. I can move the action diagrams from the top of these cards to their own separate cards. Call them "Season" cards. So in one season, you might get a good yield from shoveling, or it may be a better season to sell your goods. Hm!